More than 1 million kilometres of roads covered! 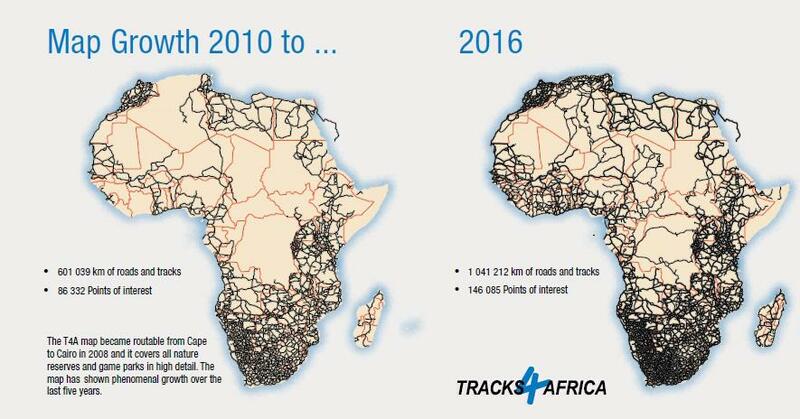 For the first time the Tracks4Africa GPS map now covers more than 1 million kilometres of fully navigable roads as well as all streets (with names) in South Africa. Usually the growth of the T4A Traveller’s Africa GPS maps is organic in nature but this version saw a significant growth of 15.5% from the previous 15.10 version thanks not only to our users’ input, but also to data base alliances that have been established. All the tracks and rich data from my seven month trek through most of Eastern and Southern Africa last year are also included in this new version. The T4A mapping team processed 616 data submissions from loyal users for the 16.05 map version. The routing for Nairobi and Addis Ababa was updated and the Northern African countries of Algeria, Tunisia and Libya now include many of the main routes of travel through them. A newbie on the map is the French overseas territory of Reunion, an island off the East coast of Madagascar. The following national parks were updated in this version: the Omo and Mago National Parks in Ethiopia, Bwabwata National Park in Namibia, Masai National Park in Kenya, Bontebok National Park in South Africa, Ruaha National Park in Tanzania and the Banhine National Park in Mozambique. 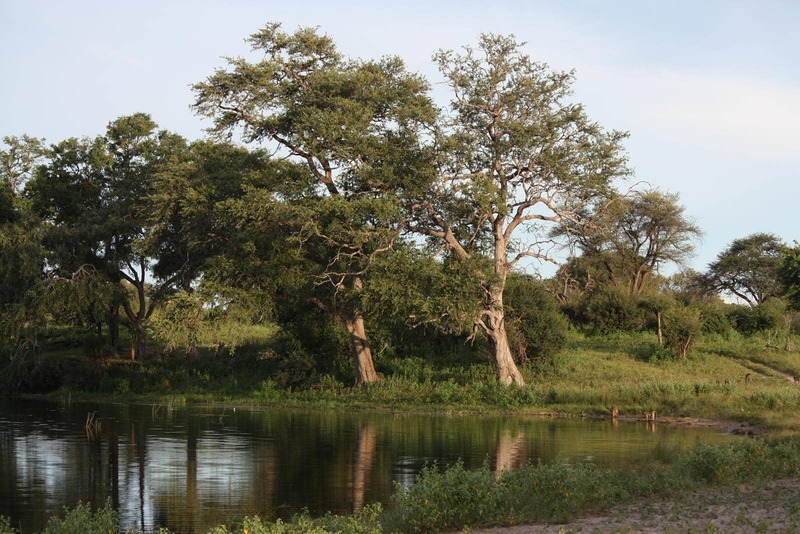 The Bwabwata National Park in Namibia. 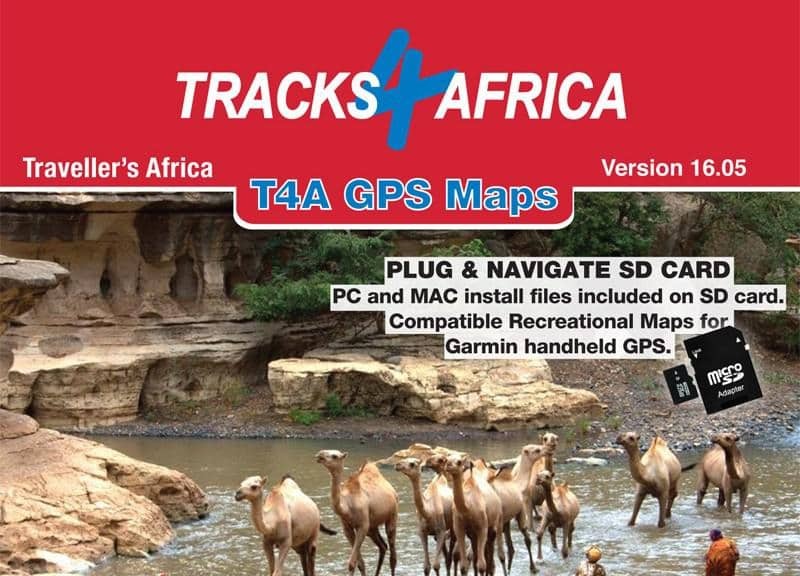 The natural beauty of Africa lies mostly in its parks and this T4A GPS map features a total of 1 452 parks; this is the most complete and detailed coverage of protected areas (including national parks, game reserves, wildlife reserves, etc) in Africa and can be accessed like all other roads on your GPS. The fuel stops category saw the biggest growth on the latest map version. Thanks to a partnership with an oil services company the new map includes 52% more fuel stops: we have now listed 10 452 places on the map where you can fill up! Importantly many non functional fuel stops have been removed and some fuel brands have changed. The most notable changes can be seen in South Africa, Mozambique and Kenya. The lodging points of interest (POIs) category on the map has increased by 13%, thanks to a partnership with Nightsbridge. Now contact details, rates, etc of lodging POIs that are listed with the Nightsbridge booking system are automatically updated in our database. Many of these listings can be booked directly from our website via a booking link. There was a 5.3% growth in the total number of Points of Interest. The T4A map now has a total of 146 085 POIs, which include 12 152 accommodation listings. With 3 815 campsites, we also have the most complete camping data base in Africa; 5% more than the previous version. The T4A GPS Maps can be used on most map capable Garmin units. You can buy the SD card version, which comes with the rich content of the Africa Guide, directly from our online shop or from one of the retailers that stock our products. Alternatively you can download the full map or certain country specific map tiles from our online shop. 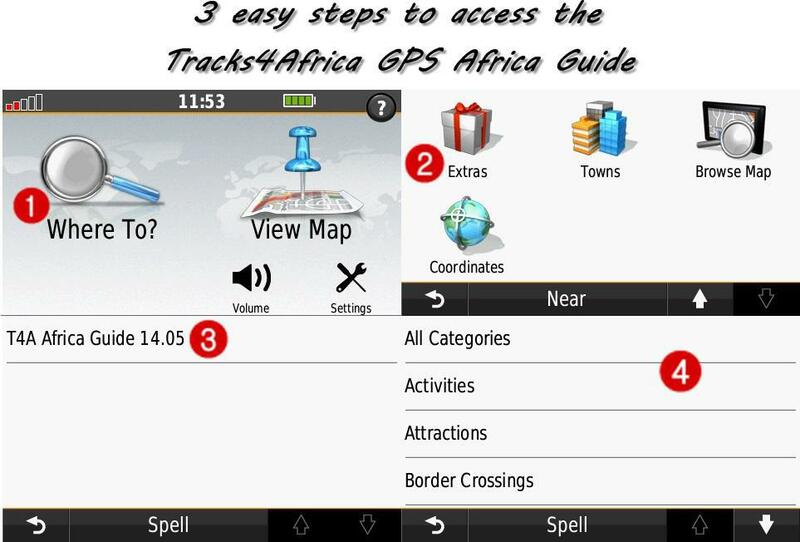 The POIs on the Africa Guide can be accessed in various ways, depending on the GPS model you use. On most models you can find it in three easy steps. Go to Where to, Extras and click on the T4A Africa Guide. Under the guide you can then search the different categories. The SD card also contains installation files for PC and Mac users who want to install the maps on their computers for trip planning. See the blog article on how to plan a route by using BaseCamp or MapSource with the Tracks4Africa map. Please note that this product is not compatible with iGO in-car navigation systems, Android or iOS devices. 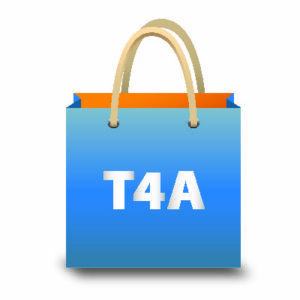 If you would like to use the T4A map on your Android device, you can get the T4A Navigator App from the Google Playstore and the T4A Navigator App for your iOS device is available from the iTunes store. See the blog article on how to plan a route on the Navigator App.